While there are never any hard-cut rules in interior design, there are certain guidelines that most would be very wise to abide by. Paint color is a very loud expression in a room, and there are certain colors and qualities of paint that are very unstable, requiring an excessive amount of balance and attention in order to make them work. Here are some paint colors that you might be better off avoiding completely for your home. It’s difficult to choose the ideal shade of white, as there are many variations available. Try to avoid the brighter shades of white, as they will appear very stark once applied to the walls in a room. Any sunlight pouring into the room will reflect harshly, and you’ll end up with a room too bright to sit comfortably in during midday. The brighter shades also tend to give your walls a more artificial feeling — a plastic-like hue that usually ends up looking far from homey. Opt for a calmer “eggshell” or “warm white” shade instead. Black is one of the iffiest colors of the paint world. While it has worked elegantly in many cases, painting black is a bold move that requires exactly the right space to work. It will make any room appear smaller. Without proper lighting around, the room can transform into a very dark and dreary space. If you must go darker, pick a red or other warm shade rather than black, so as to keep a bit of color in there that will help you when the room starts looking smaller than you expected. Bright neon colors are great for a fun space if the colors are used as accents, but it rarely works to paint a whole room in them. While great in small quantities, neon yellow can become garish when you’re completely surrounded by it. Keep your electric colors toned down and introduce any neon theme you’d like with trim, wall art, or furniture accessories. In more cases than not, painting the wall the same color as your floor should be absolutely avoided. You want that distinct separation of wall and floor, and blending them together will provide for a muddy and busy space. You should even avoid choosing similar hues; a red wall paint with a magenta-toned wood floor will overwhelm you with red, and will be difficult to balance out with any other room addition. 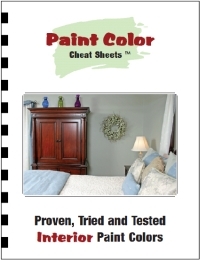 There are many cases where high-sheen paint can look great, but it depends on the wall and home you’re working with. If your walls are riddled with imperfections, either large or small like nail holes and bubbles, any gloss in your paint will exaggerate them terribly. Keep a matte finish on your paint if you’re working with imperfect walls, and you’ll also maintain a beautiful flatness to your room that will allow any light to reflect and behave naturally. Leslie Mason is a homemaker and garden expert. She loves working with local businesses, especially those dealing in furnace repair, Salt Lake City. Leslie enjoys writing, gardening, do-it-yourself projects, and fixing up the house.